Happy New Year! We are excited to get back into school classrooms to share our message of health and safety to children, teens and adults. This semester we are especially focused on injury prevention including firearm safety, safety and first aid, and teen safe driving.MORE HEALTH brings education to life and makes a difference in the health of our communities. This past year we witnessed many violent acts in schools and communities. It is important now more than ever to educate our children and families how to be safe. 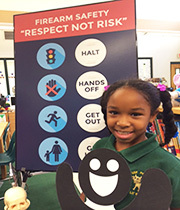 For 16 years, we have taught thousands of third and sixth grade students about firearm safety through the Firearm Safety 1 "Respect Not Risk" and Firearm Safety 2 "Responsibility, Respect, & Reason" lessons. In partnership with law enforcement, MORE HEALTH instructors teach students firearm safety procedures and steps to take if they inadvertently discover a firearm. Possessing the knowledge and tools to remain safe alleviates fear and provides students with the ability to react appropriately should a dangerous situation present itself. Through our educational lessons and partnerships with law enforcement and the school district, we will continue to strive for safer communities and strengthened community relationships. We are excited to welcome Holly Saia, Director of Student Services for Hillsborough County Public Schools, to our board of directors. We look forward to her leadership and appreciate her passion for education in our schools and communities. I am grateful to the entire Board of Directors for their efforts to raise the necessary funds needed to provide our lessons at no cost to the schools. The Eddie V’s Dinner Event was outstanding! This year is sure to bring even more opportunities to make a difference in the lives of those who experience MORE HEALTH lessons and programs. Please consider making a donation to help us teach health and safety throughout Tampa bay. Here's to a healthy, safe year! 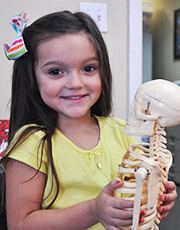 In an effort to sustain bone health and prevent osteoporosis, MORE HEATLH extends a special thank you to Florida Orthopaedic Institute for sponsoring our Bones 2: Bones & Osteoporosis "The Bone Zone" lesson! According to the National Osteoporosis Foundation, osteoporosis is a bone disease that happens when you lose too much bone, make too little bone or both. 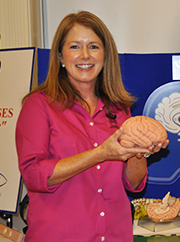 MORE HEALTH is excited to recognize instructor, Kathy Head, in this edition of our enewsletter. Prior to joining MORE HEALTH eleven years ago, Kathy worked for a Danish medical supply manufacturer, responsible for advertising, event planning, public relations and sales support. Lucky for us, the company moved out of state and Kathy decided not to join them! A friend and former MORE HEALTH instructor suggested that she apply for a teaching position and the rest is history. Over the years MORE HEALTH has had the privilege of working with the Hillsborough County Sheriff's Office in providing firearm safety education to students in the Tampa Bay area. We are honored to highlight our dear friend, Sheriff David Gee, and appreciate hearing his thoughts on this safety topic and our unique partnership. Copyright © 2016 MORE HEALTH Inc. All Rights Reserved.